Once used as a hunting dog in the Scottish Highlands, the Golden Retriever breed as we know it today is the product of Lord Tweedmouth, a half-English noble who combined dog breeds such as his original “Yellow Retriever,” the Irish Setter, and the Bloodhound. He was aiming to create a breed perfect for the cold, wet, rugged terrain of Scotland. 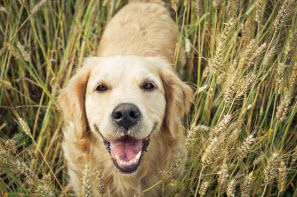 The Golden Retriever as we know it today is a beautiful, heavy-coated, playful dog. Golden Retrievers are considered the fourth most popular dog breed in America, are considered among many to be the all-American family dog, and frequently appear in popular culture. The Golden Retriever can be at risk for laryngeal paralysis. Cancer is also a common concern. There’s a reason the Golden Retriever is considered America’s dog: it is the perfect family dog! Not only are Golden Retrievers gentle, they love children and are very intelligent and stable. Golden Retrievers love to run around and play outside. They love water and tend to jump in whenever they get the chance! Golden Retrievers also love to tug on things with their mouths, whether sticks or toys. In fact, Golden Retrievers can pretty much do it all! Because they are highly trainable and eager to please, they are extremely popular as service dogs. Besides helping the blind and disabled, they are also used to sniff bombs or drugs, as rescue dogs during natural disasters, and as lifeguard dogs because of their swimming ability. Grooming and shedding! Golden Retrievers are among the heaviest shedding dog breeds and shed twice a year. This is something to consider if you’re not sure you can handle golden fluff coating your house! Also, they require regular grooming. When they aren’t shedding, they need to be groomed at least once a week; when they are shedding, grooming should be done daily. Golden Retrievers need space, and a lot of it. Having a yard, preferably with fencing, is a must. They are big, sprawling dogs with lots of energy and need to have space to move about, exercise, and generally blow off steam. Plus, they have huge furry tails that can easily wreak havoc in a small space! Golden Retrievers, like many dogs, need lots of exercise. If you are sedentary or don't have time to take a Golden out for up to 90 minutes of exercise per day, it might not be the right breed of dog for you. Chewing. Goldens love to chew! The typical Golden Retriever household has a few stray chew marks here and there – on furniture, on toys, and on other items. Keep this in mind. I’m over here! Golden Retrievers love people, plain and simple, so they need attention If you aren’t around enough to spend time and bond with a Golden Retriever, he’ll end up stressed and unhappy.